well, the alphabet is pretty straightforward, and it uses spacing between words :) ! 2. there’s a whole bunch of dialects, to the point where some have suggested that the differences between regional dialects are comparable to the differences between german and dutch. i.e.- they sound alike, but aren’t mutually interpretable. Otherwise, I didn’t know much. by the way, in the list mentioned in #1, thai is considered twice as easy to reach proficiency in, at 1100 hours, and german is at 750 hours. My personal experience was that thai was several times more difficult than German. I think this is because of the abundance of language resources for learning german, as well as the prevalence of people in this area fluent in both english and german. the thai alphabet is quite a bit more complicated than the arabic one: twice as many characters, all tonal, and the handling of vowels is less-standardized than in arabic. tonal pronunciation is really challenging as well, and especially, it’s hard to stop using native english tonality. imagine trying to ask a question without raising your voice at the end. arabic uses the same voice raising question indicator as english. thai doesn’t have much complexity in the way of cases, conjugation, or tenses. It has a whole world of cultural nuances that would be really difficult to grasp without immersion, but the grammar and sentence structures are pretty simple. I’m going to *try* to learn Modern Standard Arabic with a focus on North-African dialect- however, I’m not sure how great the resources will be for the latter half. According to what I’ve read, MSA is understood by all arabic speakers, but in real life, people speak colloquial dialects. I’d like to, at some point, visit Morocco. Luckily, Arabic Pod 101 does seem to focus on Moroccan arabic, and has a great one dollar deal that allows you to download hundreds of lessons. Again, all initial observations about arabic may be revised as this project continues! 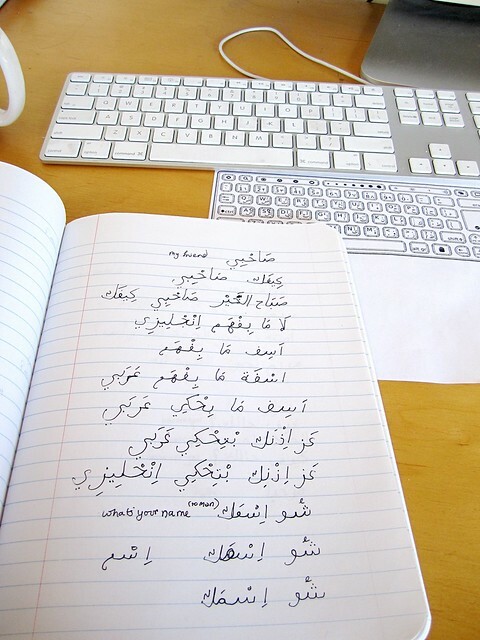 resources for learning arabic are much more widely available than thai. an example of the market for a language is indicated by how many levels pimsleur and rosetta stone will offer. for instance, french, german, and spanish for english speakers are offered in 3 comprehensive levels by pimsleur. So is eastern arabic. Thai gets one level. A pimsleur level is about 16 hours of audio instruction. and I’ve started using the portland public library system :) – I took out several books on learning arabic right away, and ordered the pimsleur audio through interlibrary loan. I won’t pay that much again for a system, unless I had some serious time crunch. I do feel the pimsleur approach worked well for learning german, because of the repetition. I didn’t like rosetta stone for learning thai. All the language learned was non practical. For instance- would you rather learn to say “the lady walks the big dog” in a foreign language or “hi, how are you, what’s your name.” Rosetta Stone thai took the former approach, never getting around to conversations. This might be a peculiarity of the less popular languages, so I wouldn’t assume this is true of french & spanish. So interesting, Brook. I just love the way you tell your linguistic stories as though you were simply debating the differences between a a blue skirt or a red dress! So fresh and matter-of-fact…ly. Lovely style of writing, for something so complex for many.